SUU Department of Music hosts their Annual Percussion Festival on Saturday, April 15, 2017, beginning with a workshop at 2 p.m. and culminating with a concert that evening at 7:30 p.m. given by the Percussion Ensemble featuring Dr. Lynn Vartan and special guest artist Michael Burritt. All events will take place at the Music Building Thorley Recital Hall. Admission is free and open to the public. Burritt currently teaches at the esteemed Eastman Conservatory of Music as Professor of Percussion. He is in high demand as a performer and has played all over the world. Burritt not only performs on the marimba; he has also composed concertos, solo and chamber works for the marimba and percussion. Students in the Percussion Ensemble has been working throughout this semester to prepare for this final concert of the year. They will perform their spring repertoire. Michael Burritt will perform a few solo pieces throughout the evening. 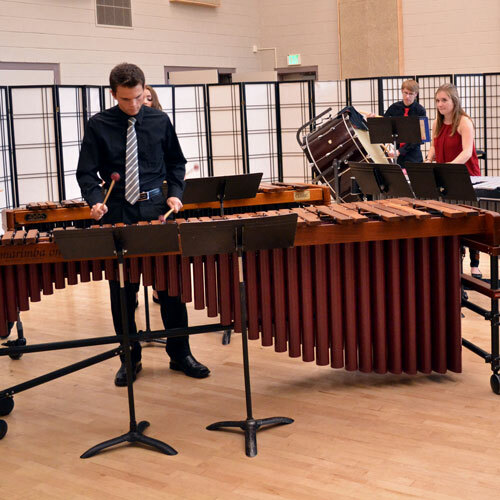 The goal of the SUU Percussion Ensemble is to perform historically significant works for percussion, contemporary percussion literature, novelty percussion and traditional non-western percussion music. The ensemble is comprised of both music majors and non-majors and welcomes students with a variety of levels of experience. Several performance opportunities are available to members of the Percussion Ensemble throughout the year. For more information about the percussion program at SUU, please visit www.suu.edu/pva/music/percussion.